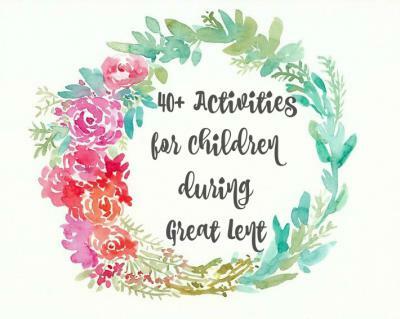 One of the things parents constantly ask is how to keep their children involved during Lent. It’s a tricky business, this Orthodox child rearing. As parents we struggle with finding balance between regular every day activities (both theirs and ours) and making sure our children keep in mind the seriousness of what we’re preparing for. Involving them should be a process everyone enjoys, a special time to pass on spiritual lessons in a way a child will both learn from and have fun with. Below is a list of activities, one for every day of the fast except for Holy Week. Great Lent is a busy period full of extra services and hopefully more outreach and personal prayer, so this list is to simply help you fill in the holes as needed. You can follow it and do each activity on the day it’s assigned, choose only the days you want or need an extra activity or simply go through the entire list and highlight the ones you really like. It’s completely up to you. The important thing is to not become overwhelmed-keeping a peaceful and prayerful spirit and home should be first priority! Monday- Choose a prayer or scripture verse to memorize. This could be the Jesus Prayer for smaller children or Psalm 50 or the Creed for older ones. Practice it daily during Lent. Wednesday-Order your child a prayer rope of their very own. You can get one at your church bookstore any of these shops. They’re both run by good friends of mine and I can vouch for their quality! Thursday-Bake Kyra Sarakosti “cookies.” These are not to be eaten but your child will cut off one of her feet every Saturday as we count down to Pascha. Learn more about Lady Lent and get the recipe here. Friday-Read Verses Alpha through Epsilon of Rejoice, Panagia: Offering to Children The Akathist Hymn. Since we attend the Salutation services each Friday during Great Lent, this book provides an excellent introduction to the service to children (and adults!) Attend the service and let them bring their book. Saturday-Talk about the First Sunday of Great Lent-The Sunday of Orthodoxy which we celebrate every first Sunday of Lent. Let them choose their favorite icon to bring to church tomorrow. Sunday-Watch a Christian themed movie. Some of my favorites are the Storykeepers and Torchlighters series. All available here. Monday-Fill a bag with items no longer used or needed and donate it to a local shelter. Tuesday-Talk to your priest about giving you a tour of the church. It’s good for children to be in the church when there isn’t anything going on and learning about the things they’re surrounded with each week will help them better understand their faith. Maybe ask him about getting a group together for the tour. Wednesday-Talk about something that makes them angry and how to handle it better. If it’s a person who angers them, pray for that person. A great book for this is Daniel and the Lion by Claire Brandenburg. Thursday-Make a lenten goals poster or journal. We always like the Less Of/More Of format. This makes it easier to break things down into actual tasks. Friday-Read verses Zeta through Kappa in the Rejoice, Panagia book. Attend the Salutations service and let them bring their book. Saturday-Talk about the Second Sunday of Lent-The Sunday of St. Gregory Palamas. Sunday-RAK. Perform a random act of kindness with your child and discuss how it made you both feel and why God wants us to always be kind to others. Monday-Draw or write a thank you note to your priest. Have them include any questions they might have. Tuesday-Cook or bake a meal or snack and deliver them to a neighbor or family member. Wednesday-When I talk to my children about confession it goes something like this. We all have a spiritual backpack that we will wear when trying to ascend to Paradise and Christ. When we do good deeds, Christ places a reward in our backpack and rewards have no weight. But when we sin, we place a big heavy rock in our backpack. The only way to remove the rocks is to go to confession. It’s a little cheesy, I’ll admit, but my kids have always related to that image and even my older ones still refer to their backpacks. Make a list of things they need to confess and make an appointment for confession. Thursday-Spend five minutes with your eyes closed and pray the Jesus Prayer with their new prayer rope. Friday-Read verses Lampda through Omicron in Rejoice, Panagia. Attend the Salutations service and let your child bring the book. Saturday-Discuss the Third Sunday in Lent-Veneration of the Cross. Sunday-Light a candle and pray for someone in need of extra prayers. Monday-Plan a visit to a nearby monastery. If this is not possible research and discuss the importance of monasticism in Orthodoxy. Wednesday-Take a nature walk. Collect treasures in your backyard or a nearby park and talk about how God made each and every thing unique and for a purpose. Thursday-Fast from all electronic devices. Friday-Read verses Pi through Yiota in Rejoice, Panagia. Attend the Salutations services and let them bring their book along. Saturday-Discuss the Fourth Sunday of Lent-St. John of the Ladder (Climacus). Sunday-Pay special attention to the Guardian Angel Prayer during Small Compline. If they’re able to read it, let them. If not, read it slowly in a way that they can understand it. A beautiful story about Mother Alexandra, former Princess Ileana of Romania, and her vision of hers and her brother’s Guardian Angels can be found here. My kids LOVE hearing this story and I love telling it! Monday-Choose one of the saints celebrated today and read their story. Tuesday-Fast from saying anything negative. Wednesday-Read the story of their patron saints. Thursday-Do a chore without being asked. Friday-Read verses Fi through Omega in Rejoice, Panagia. Attend the last Salutation service and let them bring their book along. Saturday-Discuss the Fifth Sunday in Lent-St. Mary of Egypt. Sunday-Pack blessing bags and deliver them to homeless on local street corners. Monday-Fast from complaining all day. Tuesday-Spend five minutes praying on their prayer rope for someone other than themselves. Wednesday-If you haven’t already, you’re running out of time! Attend a Pre-Sanctified Liturgy. Thursday-Plant something. Either in a small pot for the kitchen windowsill or in your yard. Discuss new life and the resurrection. Friday-Buy a tapered candle (beeswax are my absolute favorite because they don’t drip a quarter as much wax as the white ones) and decorate it for the Resurrection Service. Saturday-Lazarus Saturday. Read the story of Lazarus’ life in the Bible and bake Lazarakia breads. Holy Week is busy enough with the packed schedule of services and the best way for you and your child to learn the faith is to attend as many as possible. Wednesday-Twist a crown of thorns and talk about how Christ is betrayed this day and tomorrow would be mocked and condemned to death. A super easy way to make a crown of thorns is to buy a small vine wreath from the craft store and let your child poke toothpicks through it. When Pascha is over you can take the toothpicks out and save the wreath to use again next year. Thursday-Dye your eggs red. Talk about where this tradition originated from. A great book on this is The Miracle of the Red Egg.